Distribution and habitat: Calceolaria genus consists of about 388 species of shrubs, lianas and herbs, and the geographical range extends from Patagonia to central Mexico, with its distribution centre in Andean region. Calceolaria species have usually yellow or orange flowers, which can have red or purple spots. 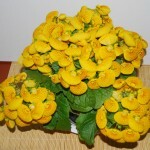 Description: From the many species of this genus, the only Calceolaria generally grown indoors is the Calceolaria herbeohybrida. These have a very decorative foliage and flowers but can be kept only for a single season. Calceolaria herbeohybrida life span indoors is about a month or several weeks of flowering time before being discarded. Calceolaria herbeohybrida leaves are large – up to 20cm (8 inch) across – roughly heart-shaped and grouped around the base of a single central stem. Above the leaves rise several branching stalks 30-60cm (12-24 inch) tall, each carrying loose clusters of pouch or slipper-shaped flowers, which vary in size (according to seed stain) from 1cm to 5cm (0.4-2 inch) across, in any one of various shades of red, orange, yellow or reddish brown. Most of the flowers of Calceolaria herbeohybrida are spotted or blotched with contrasting colour. Houseplant care: Keep plant in a place that is free from drafts and direct sun, both of which will scorch its soft leaves. 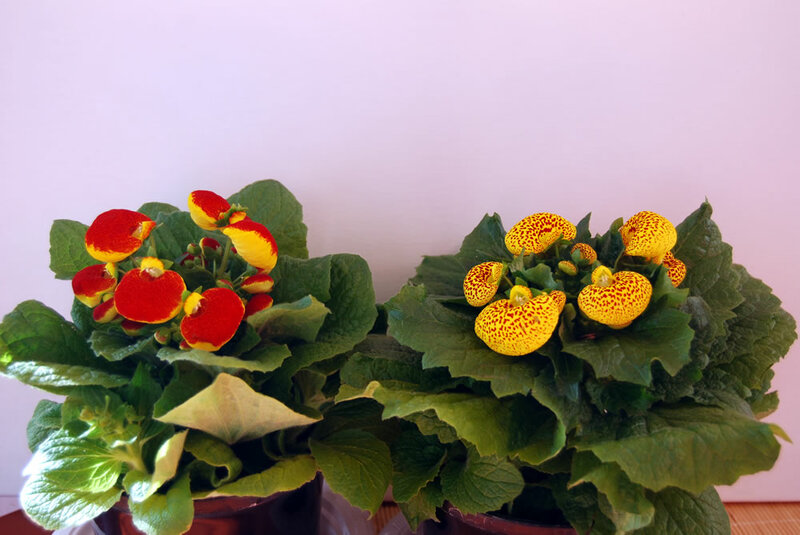 To keep the Calceolaria herbeohybrida flowering for as long as possible, proper light and temperature and plentiful watering and high humidity are essential. 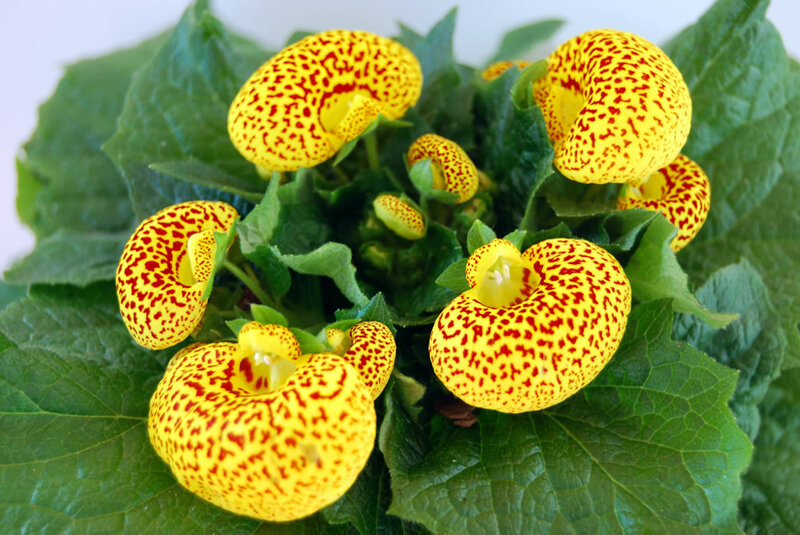 Light: Keep Calceolaria herbeohybrida in a spot with bright light but not direct sunlight. 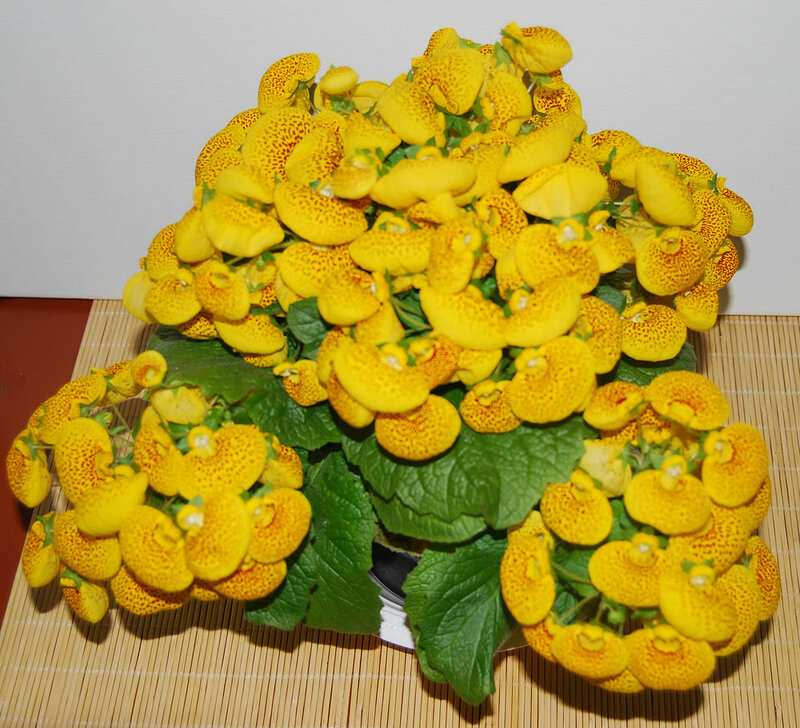 Temperature: Calceolaria herbeohybrida should be kept in cool room temperature: 7-10°C (45-50°F) at night; 13-16°C (55-60°F) during the day. Water: Water often plentifully as often as necessary to keep the potting mixture thoroughly moist. Never allow the potting mixture to dry out; dry potting mixture can cause the plant to collapse. Avoid watering over the crown of the plant because it may cause it to rot. Standing the pot on a tray of damp pebbles or peat will also extend the life of the Calceolaria herbeohybrida by raising the humidity level. 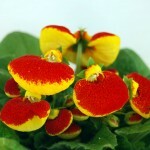 Fertiliser: Do not fertilise Calceolaria herbeohybrida while in bloom. Propagation: Commercial growers raise Calceolaria herbeohybrida from seed sown in early summer, overwintering the young plants cool at between 7-10°C (45-50°F) and sell them in early spring, when the flower buds are just beginning to open. Calceolaria herbeohybrida are susceptible to root and crown rots from the soil being too wet or fluctuations in watering. Treatment: Avoid overwatering and water the plant regularly. Limp leaves usually indicate the plants are too dry. Treatment: Immerse the pot in a bucket of water and allow the potting mixture to become thoroughly wet. When the bubble stop rising from the potting mixture, remove the pot and allow the excess water to drain away. A careful watch should be kept for aphids which are Calceolaria herbeohybrida‘s greatest enemy. They can develop to epidemic proportions in a very few days. Gray mold, whiteflies, and spider mites can also be a problem. Treatment: Use an adequate pesticide following the instructions on the label. 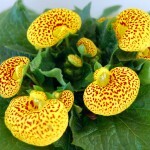 Uses: Calceolaria herbeohybrida is used primarily as pot plants and given as gifts in the late winter and early spring. They are a nice addition to a bright windowsill in winter and are a cheery gift with their bright colors and unusual flowers. 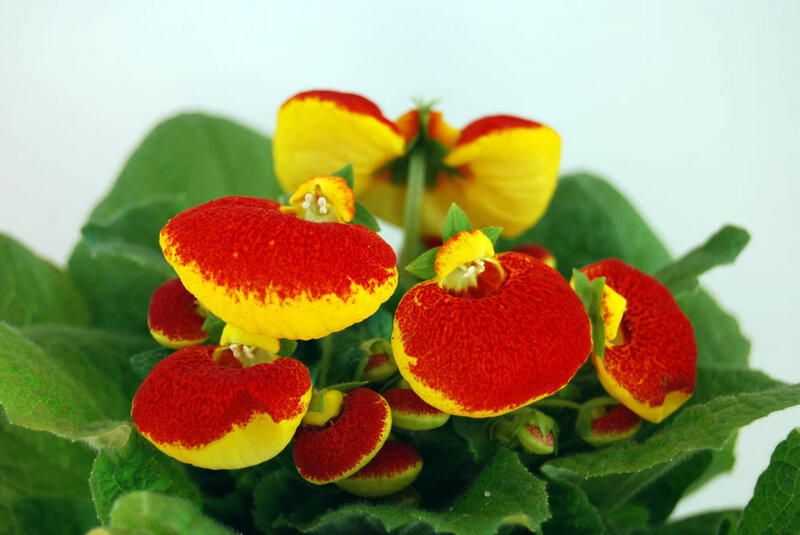 Buying tip: Choose a Calceolaria herbeohybrida plant with plenty of unopened buds to enjoy several weeks of blooms.